This is a good computer science final year project report on "rich internet application for weekly automatic college timetable generation". This project is submitted in partial fulfillment for the degree of bachelor of Engineering in Computer Science and Engineering. This project introduces a practical timetabling algorithm capable of taking care of both strong and weak constraints effectively, used in an automated timetabling system. 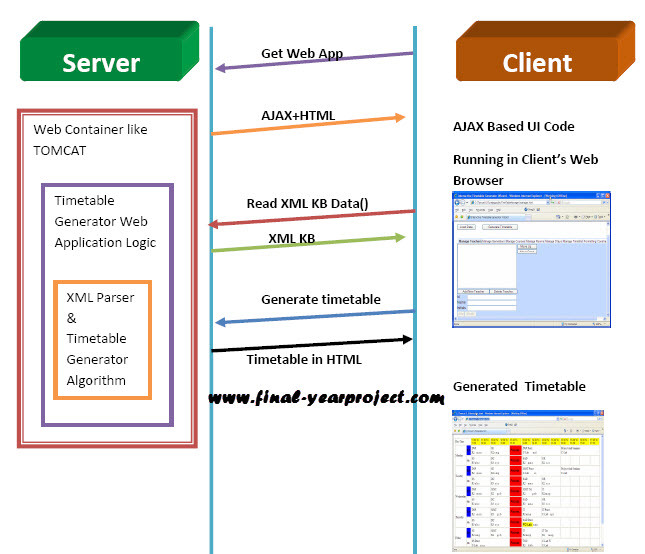 This project reduces the overhead on server of rendering client’s UI components and makes room for processing time of Timetable Generator Algorithm. You can also Subscribe to FINAL YEAR PROJECT'S by Email for more such projects and seminar. Timetabling Algorithm is main component of this project which produces the HTML based weekly timetable sheet as the output. Our project takes various inputs from the user such as Teacher list, Course list, Semester list, Room list, Day list and Time slot as well as various rules, facts and constraints using web based forms, which are stored in XML based knowledge base. This is AJAX based project and report contains working, source coding, diagram of the project. Use it for your reference and study work.